New York, NY, Jan. 25, 2019 (GLOBE NEWSWIRE) — via NEWMEDIAWIRE — Tauriga Sciences, Inc. (OTCQB: TAUG) (“Tauriga” or the “Company”), engaged in building its business through the development, distribution, and licensing of proprietary products as well as the evaluation of potential acquisition opportunities and equity investments, has today announced the showcase of its graphic design and artwork for the individual pack of it CBD infused gum. The graphic design outlay incorporates all of the specific features of this product as well as its dedicated GS1 barcode. 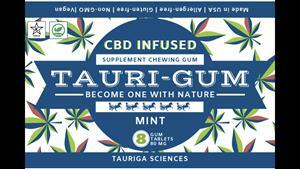 The Company’s product has been branded under the name: TAURI-GUM. The Company is targeting the month of March 2019 for its commercial launch of TAURI-GUM and is hopeful to generate revenue during this current operating quarter (its 4thFiscal Quarter of 2019).